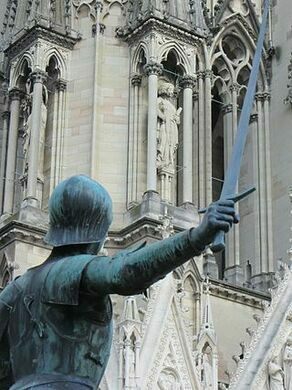 This Third Republic-era statue (created in the late 19th century) portrays the legendary Joan of Arc, a warrior, mystic, martyr, and saint who saved the city of Reims from destruction at the hands of the English army. It stands in the shadow of the very cathedral she helped protect. Born into a peasant family, the young Joan had witnessed English forces burn her village to the ground, making her family refugees. This understandably fueled her anger toward the occupying invaders. 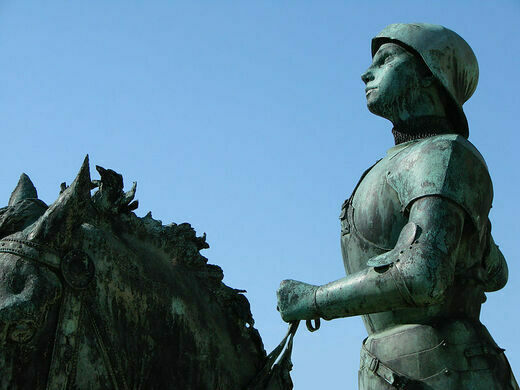 As such, her determination to fight the English made her a key figure in the battles of the Hundred Years’ War, particularly the March to Reims. 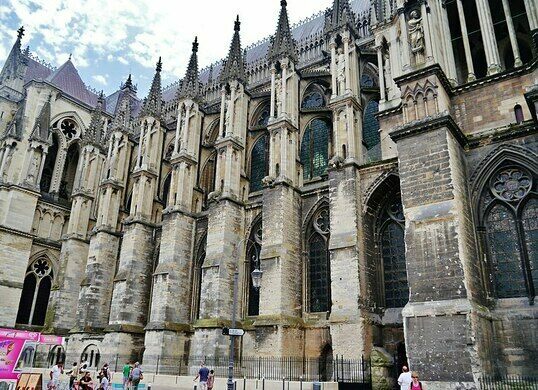 Her liberation of the Reims Cathedral allowed Charles VII of France to be crowned king. 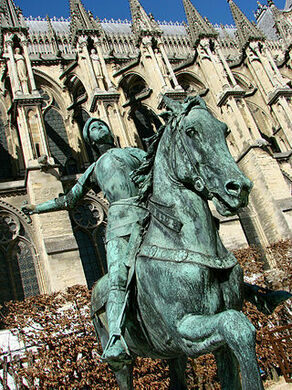 Paul Dubois’s image of her in Reims, crafted from bronze, portrays the “Maid of Orleans” as a wide-eyed woman with a noticeably ethereal demeanor as she gazes at the spires of the cathedral. Her facial expression perhaps hints at the mysticism at the heart of her life. But what this statue really shows is a depiction of a ferocious woman who is at ease in a world of warfare. 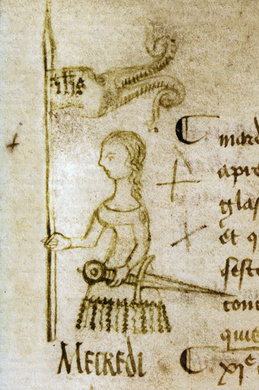 One of Joan of Arc’s steel-clad arms is held aloft, raising an épée bâtarde longsword, while her other hand grips the reigns of her war-horse. The beast itself is powerfully built, its nostrils flaring and its hoof pawing the ground in readiness to charge. 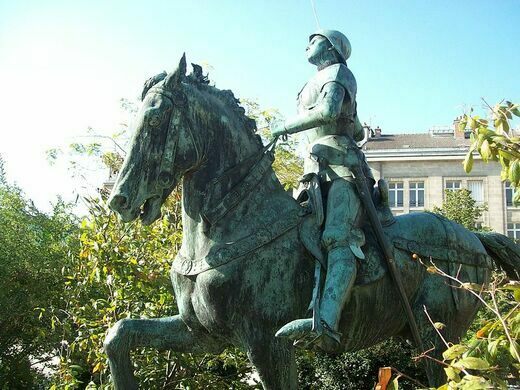 Needless to say, this is definitely not a figure you would want to see on a dark night, and certainly not if you were an English-allied Burgundian soldier in Reims during 1429, when Joan of Arc and her 12,000-strong army besieged the city. Indeed, in such a scenario, a mere glimpse of her closeup likely would have been the last sight you ever saw before being cut down by a strike of her longsword.